Nitrogen fertilisers and going to the dentist have something in common – nitrous oxide. In the dentist’s chair, we all appreciate the benefits of nitrous oxide or ‘laughing gas’, but in the orchard, nitrogen fertilisers increase the risk of producing damaging nitrous oxide emissions from the soil which is no laughing matter. Nitrous oxide emissions waste nitrogen fertilisers and have a big environmental impact. Nitrous oxide is a potent greenhouse gas with agriculture contributing around 78% of all nitrous oxide emissions, mainly due to nitrogen fertiliser use. To make matters worse, nitrous oxide also depletes the ozone layer, increasing ultraviolent radiation and skin cancer. 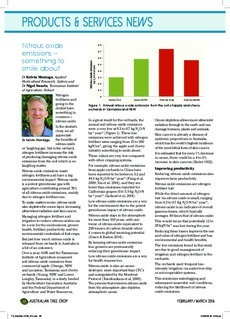 Managing nitrogen fertiliser and irrigation to reduce nitrous oxides can be a win for the environment, grower health, fertiliser productivity and the environmental credentials of fruit crops. But just how much nitrous oxide is released from orchards in Australia is a bit of an unknown. Over a year, AHR and the Tasmanian Institute of Agriculture measured soil nitrous oxide emissions from commercial apple (Orange, NSW and Lucaston, Tasmania) and cherry orchards (Young, NSW and Lower Longley, Tasmania) in a study funded by Horticulture Innovation Australia and the Federal Department of Agriculture and Water Resources.